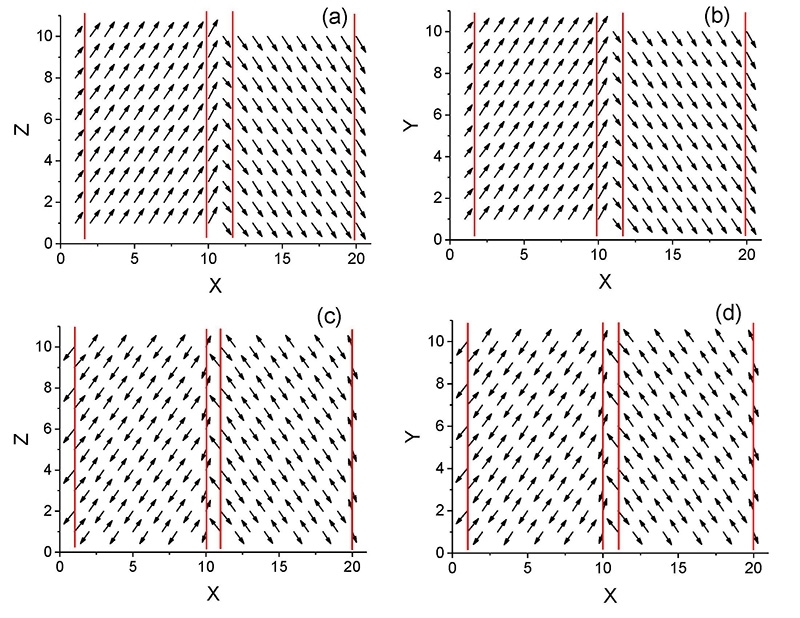 The red lines in these images illustrate the domain walls separating regions of electric polarization (top) and shifting of charged ions (bottom row) in a material called bismuth ferrite. Researchers have demonstrated that these domain walls can be used to transmit a type of electrical current, which could lead to novel electrical devices. FAYETTEVILLE, Ark. – Electrical devices in use today use conductive materials to guide electrons where they are needed. These materials must be fastened in place and insulated in order to keep the electricity on the right path. New research from the University of Arkansas makes a significant step toward a new kind of electrical device, which would use the natural properties of materials like bismuth ferrite, along with a different type of current, to send electricity quickly through smaller, denser circuits. Sergey Prosandeev, a research professor in the Department of Physics, worked with Yurong Yang, research associate professor; Charles Paillard, post doctoral fellow; and Laurent Bellaiche, Distinguished Professor. Their results are published in the journal npj Computational Materials. Using the Arkansas High Performance Computing Center, these researchers created simulations of bismuth ferrite, a synthetic, crystalline material. Bismuth ferrite is “multiferroic,” which means that it has regions, or domains, in which the molecules making up its crystalline structure exhibit a consistent pattern of electric polarization, magnetization and shifting of charged ions. The boundaries between these regions are called domain walls. These walls are two-dimensional and very narrow—they are measured in tenths of nanometers. In the simulation, the researchers created a type of current, called displacement current, by applying a high frequency electric field to the bismuth ferrite. Unlike the electric current that is produced by the movement of electrons, displacement current results from the vibration of ions in response to an electric field. The researchers found that the displacement current, which is an alternating current, or AC, naturally moves along the domain walls in the bismuth ferrite, and they also found that it is comparable in magnitude to the direct current, or DC, currently used in electrical devices. Researchers can create domains and move domain walls in multiferroic materials by selectively applying electric fields. By demonstrating that these walls can be used to transmit displacement current, this research is a significant step toward new types of electrical devices. The researchers explained that the compact nature of these devices would allow them to be very fast and very small. “This opens the way toward the design of fast nanoscale electronic circuits,” they said in the paper. This research was sponsored by the Office of Naval Research and DARPA, the Defense Advanced Research Projects Agency.